For the village in Satu Mare County, see Bogdand. For the character from The Worm Ouroboros, see The Worm Ouroboros § Characters. "Korond" redirects here. For the administrative subdivision of Iran, see Korond Rural District (South Khorasan Province). Corund (Hungarian: Korond, Hungarian pronunciation: [ˈkorond] ) is a commune in Harghita County, Romania. It lies in the Székely Land, an ethno-cultural region in eastern Transylvania, in the "Salt Region" (Ținutul Sării or Sóvidék). Corund is famous for its pottery and ceramics. The village historically formed part of the Székely Land region of Transylvania province. It belonged to Udvarhelyszék, then, from 1876 until 1918, to Udvarhely County in the Kingdom of Hungary. After World War I, by the terms of the Treaty of Trianon of 1920, it became part of Romania. As a result of the Second Vienna Award, it was ceded to Hungary between 1940 and 1944. After World War II, it came under Romanian administration and became part of Romania in 1947. 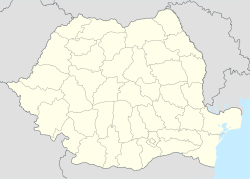 Between 1952 and 1960, it formed part of the Hungarian Autonomous Province, then, of the Mureș-Hungarian Autonomous Province until it was abolished in 1968. Since then, the commune has been part of Harghita County. The commune has an absolute Székely (Hungarian) majority. According to the 2011 census it has a population of 6,005 of which 96.74% or 5,809 are ethnic Hungarians. This Harghita County location article is a stub. You can help Wikipedia by expanding it. This page was last edited on 15 March 2017, at 20:14 (UTC).